1.The logo is composed of a circle form which its shape is derived from (The rounded Baghdad) as it was built at the beginning of its foundation . It was also surrounded by four gates: ( Khorasan Gate or the state Gate , Kufa Gate , Basrah Gate and Sham Gate). 2.The interior space of the design is divided into two parts : the top which is the big one embraces the entrance of the main gate of the university ,on both sides of the entrance Al- Thulth Al-Baghdad calligraphy which was originated in Baghdad more than 1000 years ago which is considered the master of Arabic fonts and the most difficult and beautiful ever. 3.The second part which is the smallest embraces an open book as a sign of science and knowledge and has been decorated with Quranic verse (Say My Lord , grant me more knowledge ).This part includes also the date of establishing university of Baghdad in 1378 AH/1957 AD. 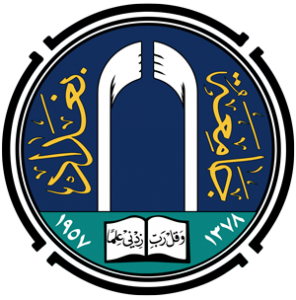 4.The color processing derived its meaning from the reality where the blue in the top is used to represent the pure sky while the green in the bottom is used to represent the fertile land which indicates development and goodness.The arcs of the entrance of the university is colored with white as its real architectural color .The name of the university is written in gold to represent the prestigious level of the university as it is described the mother university and its great role in building Iraq since its establishing till now.